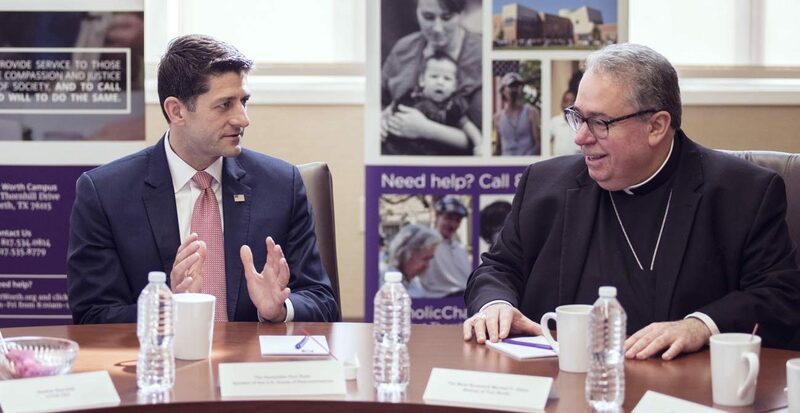 FORT WORTH, Texas (CNS) — House Speaker Paul Ryan, R-Wisconsin, has been studying poverty at the federal level from Washington, but he took a few hours to learn what poverty looks like on the front lines with a visit to Catholic Charities Fort Worth April 3. After touring the facility and meeting with three clients and case managers, Ryan and Heather Reynolds, president of Catholic Charities Fort Worth, met with the agency’s staff and supporters to discuss the 50-year war on poverty — the welfare and social legislation introduced by President Lyndon B. Johnson to help end poverty. One problem Ryan articulated is that the federal government has been measuring its success in eliminating poverty by how much it has contributed to the 80-plus federal programs that assist the poor, which adds up to more than $15 trillion over 50 years. However, few of those programs evaluate actual outcomes, he said. Catholic Charities Fort Worth also has been trying to break the cycle of poverty, and it came to the same realization that its efforts needed to be measured to determine their effectiveness. Two years ago, the nonprofit partnered with the Wilson Sheehan Lab for Economic Opportunities at the University of Notre Dame to evaluate the efficacy of their poverty assistance programs. Year-one results indicate that intensive case management is crucial to accomplishing the Catholic agency’s goal of eliminating poverty, one family at a time, in the 28-county diocese it serves. Success has been measured in two programs in particular: Stay the Course, which provides low-income college students with comprehensive social support to help them complete their degrees; and Padua Pilot, which gives clients broad-based intensive case management to assist them with their health, finances, education, child care, housing and other needs. Looking at six years of data, the Notre Dame researchers determined that Stay the Course students have been four times as likely to complete their degrees compared to the control group. And in Padua Pilot’s first year, clients saw their incomes increase 19 percent while their spending decreased 20 percent. Tonita Burbage, a Catholic Charities client who attended the town hall, was laid off in 2014 and struggled with unemployment and underemployment for two years. She credited Catholic Charities’ assistance in helping her find a full-time job with benefits so she could support her two daughters without government assistance. He envisioned federal resources working in partnership with the private sector at the local level to move families out of poverty. Fort Worth Bishop Michael F. Olson, who accompanied Ryan on his tour of Catholic Charities, said the speaker’s visit “shows that church and state can work together, and I think it also shined a light on why our Catholic Charities is doing so well. Moses is associate editor of North Texas Catholic, magazine of the Diocese of Fort Worth.